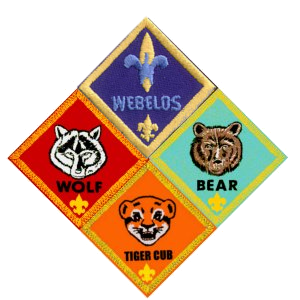 To earn the Wolf rank a Cub Scout must complete 6 Achievements and one Elective that are offered along the Wolf Trail. Your scout will be provided with a Wolf Handbook to begin his trail. Below is an outline of the material covered in the handbook. 4 - With your family or den, make a list of possible weather changes that might happen on your campout according to the time of year you are camping. Tell how you will be prepared for each one. 6 - On the campout, participate with your family or den in a campfire show. Prepare a skit or song, and then present it at the campfire for everyone else. 7B - Recite the Leave no Trace Principles for your Leader. 7C - After your campout, list the ways you demonstrated being careful with fire. Participate in a flag ceremony and learn how to properly care for and fold the flag. A. Attend the Pack Committee Leaders meeting. Present ideas to the pack committee regarding your service project. Talk to a military veteran, law enforcement officer, member of the fire department, or someone else who works for the community. A - Learn about the three R's of recycling. B - Make your own recycling center or contribute to an existing one. A - Visit a religious monument or site where people might show reverence. B - Create a visual display of your visit with your den or your family, and show how it made you feel reverent or helped you better understand your duty to God. A - Give two ideas about how you can practice your duty to God. Choose one, and do it for a week. C - Learn and sing a song that could be song in reverence before or after meals or one that gives encouragement, reminds you of how to show reverence, or demonstrates your duty to God. D - Offer a prayer, meditation or reflection with your family, den or pack. Go on a 1 mile hike with your den or family. Watch and record two interesting things that you've never seen before. Name 2 birds, two insects, and two other animals that live in your area. Explain how you identified them. Draw a map of an area near where you live using common map symbols. Play catch with someone in your den or family who is standing 10 steps away from you. Demonstrate what it means to eat a balanced diet.